Extend one USB Power Delivery Type-C charging port, 2 * SuperSpeed USB 3.0 ports, 1 * Support VGA Port, 1 * SD memory card slot and 1 * TF memory card slot. 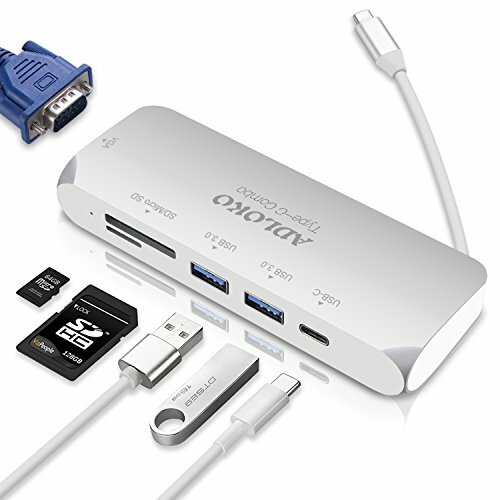 It allows you to simultaneously connect up to 2 USB 3.0 port (e.g. keyboards, mice, speakers or thumb drives) to a USB-C laptop and transfer data at up to 5 Gbps. Enable you to easily transfer files from SD/TF card on your USB-C laptop. Solid Aluminium 6-in-1 USB C Hub: Extend 1 * USB Power Delivery Type-C charging port, 1 * USB-C to VGA Port, 2 * SuperSpeed USB 3.0 ports, 1 * SD memory card slot and 1 * TF memory card slot. 2 SuperSpeed USB 3.0 ports allow you to simultaneously connect up to 2 USB-A peripherals to a USB-C laptop and transfer data at up to 5 Gbps. Backward compatible with USB 2.0 and USB 1.1. Type c Hub charges your MacBook Pro or other Type-C devices while connecting multiple peripherals or transferring data. VGA port supports to connect Mac / MacBooks / PC / laptops to monitors / TV / HDTVs / projectors. With USB C Hub to VGA adapter, it will create a wonderful home theater for fun or make presentation for works. Multifunction SD/TF Card Reader: Enable you to easily access files from either an SD card or a TF card on your USB-C laptop. The product built-in hidden cord easy to carry. Thin,lightweight and compact. Plug and play installation. Support hot swapping function.It easily slips into any bag for you to bring your laptop on business trips or vacations. If you have any questions about this product by ADLOKO, contact us by completing and submitting the form below. If you are looking for a specif part number, please include it with your message.